If you look carefully at the stained glass image on this card, versus the stained glass window on the sympathy card I posted last week, you will see that it is the same image minus the arch at the top of the window. I also used So Saffron on the glass panes that did not have flowers or butterflies. It is such a different look! 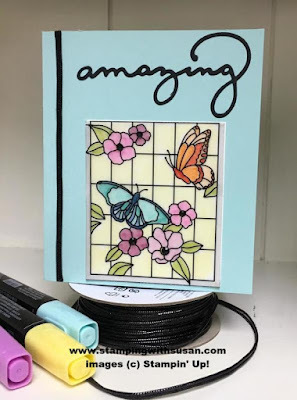 Stampin' Blends are perfect to color these images. I am excited that there are additional colors of Blends up the upcoming annual catalog. I really need to start showing some love for the other vellum paper in this pack! LOL!